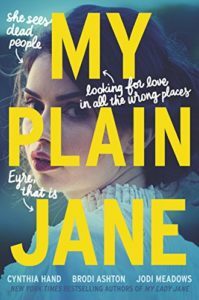 Based on how much I enjoyed My Lady Jane, I immediately pre-ordered the follow up novel, My Plain Jane which tells the true story of Jane Eyre. The last novel included an apology to England for what the three authors were about to do its history while this one started with an apology for what they would do to its literature. Like the previous novel, this one is fun, irreverent, and hilarious. However, I preferred the previous novel. This might simply be because of my love for English history while Jane Eyre is one of those books I feel like I should have liked but was mostly ambivalent or apathetic about. (I’ll take Austen over the Brontes any day). Since I don’t have a great love of the base material (maybe I should use my next Audible credit for a revisit), I may not have appreciated the alternate approach as much. Of course, I would also argue that shape shifting magic is always more fun than ghosts so that might be part of it. As it turns out, King George III was not crazy: he could see ghosts so it sometimes looked like he was speaking to trees when he was simply conversing with ghosts. However, being viewed as crazy was not a good thing so King George III funded a ghost hunting society. His successors have reduced the budget to the organization, so what was once a very prestigious organization has been severely downsized. Not just anyone can join the society – they must be able to see ghosts. Usually, it takes temporarily dying to activate the ability though it is no guarantee. The novel starts out very familiar to the known version except that Jane Eyre can see ghosts. Being at a miserable school for girls with a sadistic director, there are quite a few ghosts around for Jane to interact with, too, including her deceased best friend Helen – turns out death was only a minor set back in their friendship. Charlotte Bronte and her sisters are characters as fellow attendees of the school, and Charlotte plots a few intricate schemes at various points in the novel, showing her developing writer’s creativity. She is not afraid to withhold information or use minor extortion to get her way, either. Alexander, one of the remaining ghost hunting society members, recognizes Jane’s abilities early in the novel while on a mission near the school, and he spends much of the novel trying to recruit Jane even following her to her new position as a governess with Charlotte and Branwell Bronte in tow. Just like in the published novel, Jane falls in love with Mr. Rochester due to an unfortunate susceptibility to tall, dark men based on the literature of the time and her complete lack of previous interaction with men. This is where Helen really ended up shining – she was the reader stand in, constantly questioning Rochester’s action to Jane, and trying to beat some sense into her. Overall, I enjoyed the novel and the spin the authors took on Jane Eyre. As I said, I am not sure if my preference for My Lady Jane was simply that the subject matter appealed to me more or if it was due to the raised expectations for this book created by My Lady Jane, but I am definitely looking forward to future collaborations between the three authors. Also, there is a very slight call back to Lady Jane Grey that I appreciated. Now that they have set the matter straight with regards to English history and English literature, I am curious to see what they might explore next! Share the post "The Real, Unedited Story of Jane Eyre"
Interesting! I like the ghosts – cool. And you’re right about Austen vs. the Brontes. Audible: should I take the plunge? Worth the expense? I like it, but I am still primarily a reader so sometimes I never know what to get as audiobook vs what to get as a book. I ended up with some credits saved up as a result and ended up getting some nonfiction and a classic, things I normally like but don’t always have the patience for. And I am reading Retta’s memoir now and really wish I had gotten the audiobook! The major thing is just lifestyle – if I am sitting, I read. My current commute involves twenty minutes of walking with a train ride in between one way so I am actually getting getting through books now, but before this I was taking an Uber to work (work travel) so I didn’t listen at all during that period. I’m working on my review of this right now, and I agree it wasn’t as good as the first one, but I’m chalking it up to not being as purely funny. I am very unfamiliar with that time period of English history, and I love Jane Eyre (which is great by audio, by the way; I did the version narrated by Josephine Bailey, but Thandie Newton does the Audible one) and I still loved the first book more. Thandie Newton? I’m sold – I never finished Westworld but she was definitely my favorite part. I also just finished The Dispatcher and I need Zachary Quinto to narrate more things! It will be interesting to see how listening to it might change my perspective – I have always said Persuasion is my favorite Austen but I hadn’t read it since college. I knew many of the characters were superficial, shallow and bit horrible but listening to their words rather than reading them – dear lord! It really makes it even more obvious that Austen was subtly judging and making fun of everyone! For the past several years, I’ve been doing most of the classic books I read by audio, and it really helps to hear that human voice with the old fashioned words. I wasn’t really a big fan of Jane Eyre before I listened to it, but I found that I really enjoyed it that way.